Disease transmission occurs with a perfect balance of the epidemiological triad consisting of an external agent, a susceptible host, and an environment that brings the agent and host together. Conflict situation is an ideal platform that creates this confluence of agent and host in perfect environmental conditions, for pathogens to tear through soldiers and refugees alike. Classically during armed conflicts, soldiers and displaced population get exposed to unsanitary and overcrowded barracks, trenches, refugee shelters, and concentration camps with disruptive health-care services. Many get susceptible to diseases prevalent in the relocated region and some may introduce pathogens in the native population. The earlier wartime epidemics were considered as divine interventions and wrath of God. As medicinal knowledge advanced, prevention strategies evolved from isolation and quarantine to sanitary measures against miasma and further to chemoprophylaxis and immunization against the pathogen. The advent of antivector chemicals and antibiotics revolutionized the control of epidemics during the World War II. Although not infectious in origin, modern-day outbreaks are mostly health events such as posttraumatic stress disorders in postwar or war-like scenario. This article chronicles the epidemiology of the better-known wartime epidemics. Wars have been waged throughout history in pursuance of glory, expansion of kingdoms, political compulsions, and reaffirmation of civil rights among other reasons. Pestilence is one of the major fallouts of war, which often has a catastrophic effect on the soldiers as well as the local civilian population. 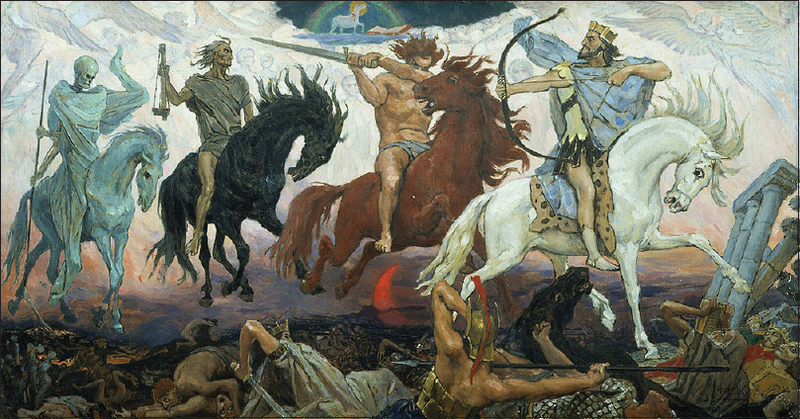 Humans understood their synergist and noxious interactions from biblical times and hence were referred as the demonic consorts or apocalyptic horsemen as shown in [Figure 1]. The scourge of epidemic has decimated several powerful armies and civilizations of the yesteryears. Pestilences assailed and ravaged humanity from the Peloponnesian War of 430 BC between Sparta and Athens for supremacy of Greece. In fact, by the end of World War II, more soldiers had died from war-time epidemics than from enemy action. The fight for power is unlikely to stop as humans become more ambitious, and the trail of wartime epidemics is likely to continue. Malnutrition and extremes of ages make refugee population vulnerable due to low immunity. Favorable environmental factors help in creation and propagation of epidemics before the sanitary revolution, cleanliness was a rarity and was viewed as acts of vanity. Survival was a miracle not only because of endemic disease, dirt and filth, concomitant poor hygiene, and sanitation but also because of the primitive state of medical knowledge. Thus, a large number of people were prone to infections for a sustained duration of time, within a constrained health system. Thereafter, exploration and colonization for political dominance contributed to the spread of infectious disease. Troops, equipment, as well as displaced persons constantly moving during war carried with them infectious disease organisms and vectors. This was often coupled with destruction of the physical and economic infrastructure of the area. This article is an effort to chronicle the epidemiology of the better-known wartime epidemics and how public health has evolved through war into today's understanding of modern medicine. The earliest report of epidemic in conflict situation dates back to the Peloponnesian Wars in 430 BC, fought between Athens and the Spartan hegemony of Peloponnesian states. Commonly known as the Plague of Athens, it originated in the African troops of Ethiopia. During their winter March to join the Athenian army, they spread it in the Eastern Mediterranean empire of Libya, Egypt, and Persia. On reaching Athens, the plague consumed the Athenian General Pericles and also shattered the fighting strength of the army. The panic was so massive that, despite military superiority, Sparta postponed her invasion for a year, though later won the war. All major outbreaks of these times were referred to as plague, meaning an affliction with deadly consequences. The symptoms of this outbreak described by Thucydides, a Greek historian were violent heat in head, redness of eyes, and bloody throat emitting fetid breath. This was followed by sneezing, vomiting, and unquenchable thirst then violent spasms. Finally, the skin became livid and covered in pustules and ulcers. Most died around the 7th or 8th day. Very few people survived and most of them lost sight, fingers and toes. By this description, however, smallpox seems to be the most likely agent. This is the earliest example of how an extremely infectious and deadly disease introduced in a nascent population due to troop movement, devastated the fighting capacity of an entire empire. Winter and overcrowding were conducing environmental factors for the organism to thrive in the camps and made sure that the transmission was explosive. After the death of Emperor Antoninus Pius, civil war ensued. Then, the Parthian Empire (in present-day Iran) initiated hostilities with the Romans, which came to be known as the Marcomannic War of Persian Gulf. In 161AD, the Roman General Lucius Verus led the campaign and after 5 years of intense battle, returned home victorious from Syria. Along with the riches of war, the Roman Army brought along a germ so catastrophic that it raged the kingdom for 15 years and killed an estimated 5 million, i.e., up to one-third of the population. It spread through trade routes from Persia to Spain and from Britain to Egypt. It killed Lucius Verus and thereby got the name “Antonine” Plague after the family title. According to Roman historian, Dio Cassius in 178 AD, during the peak of the epidemic, it consumed 2000 people a day in Rome alone. It destabilized trade, wiped out whole villages and towns, decimated 90% of the Roman Army, and shrank the labor forces which probably led to the eventual decline of the great Roman Empire. As per the descriptions provided by Galen, who treated it by theory of humors, the causative agent was probably smallpox. However, some experts have named Measles and Anthrax as the other possible causes. In the 5th century AD, after laying the foundations of a strong Byzantine kingdom with Constantinople as capital, emperor Justinian I set out westwards to reclaim the glory of Rome. However, there was a poor crop yield in whole of Southern Europe during this period, possibly resulting from unusual snowing in late summer and a decrease of sunshine as suggested by Historian Colin Barras. War necessitated enormous food supplies, shipped from the fertile lands of the Nile, and the first descriptions of plague emanated from the port and storehouses of Pelusium, Egypt. When the Byzantine Army with rat-infested food provisions marched out to war, the disease followed the trail of grains and plague spread-like wildfire throughout the Mediterranean basin wherever the war went. Procopius of Caesarea chronicled the cataclysm of the disease which at its peak caused nearly 5000 deaths per day in Constantinople and wiped out nearly one-fourth of the European population. The disease started off with mild fever, and later swellings and black blisters filled with pus were noticed on the groin, armpits, and behind ears. This was followed by delirium and coma-like state. DNA analysis of bones and tooth from the graves of victims outside Munich, Germany has identified Yersinia pestis as the agent. By the end of the conquest, plague had consumed soldiers and civilians alike and converted the area won as a ghost territory. This was the first instance of a disease piggybacking the ill-maintained supply, logistic chain for spread. In 568 AD, the ruler of Yemen from Aksum kingdom of Ethiopia laid a siege on Mecca with hundreds of war elephants. The invasion failed as a deadly disease decimated the troops. As per historical description, the outbreak seemed to be caused by smallpox. On their way back to Africa, they spread it in the Arabian and Egyptian port cities. Later, when these ports were invaded by tribes from interior Africa, the epidemic spread through supply and trade routes till Nubia. In the 13th century, Caffa located in the Crimean peninsula of Ukraine was at the crossroads for trade, thereby linking Central Asia to Europe. Following tensions between the Italians and the Mongols, the Golden Horde under the leadership of Jani Beg laid siege to the city in 1347 AD. The siege was broken 4 years later when reinforcements arrived from Italy. By that time, the invading army was decimated by a deadly epidemic from China. In the final stages of the siege, the Mongols used possibly the first time in the history of humankind, Biological warfare. They catapulted their infected corpses into the city. This resulted in traders to flee from the city. Rat-infested cargo ships from Caffa were primarily responsible for the transmission of the Great Plague of Middle Ages into Europe. During the voyage, the rats used to die but the profuse and hungry fleas infected the sailors during emptying of the ship's holds. Shore rats of European ports thereafter got infected from these sailors, transmitting plague to the port cities. As per the memoir of Italian historian Gabriele de' Mussi, this was the turning point in the history of black death as it spreads to the rest of Europe as far as to London. Filth was a fact of life for all classes in the Middle Ages. Open sewers in streets, scanty water supply, garbage and animal carcasses thrown into rivers, rampant fleas, rats and mice, and nonexistent knowledge of hygiene were the major factors for the spread of plague. Southern Europe was devastated with Florence in Italy losing a third of its 90,000 residents in the first 6 months. The humbling of the medical profession because of its incompetence to control the plague of the 6th Century, essentially halted the advancement of medical knowledge for centuries. As epidemiology of diseases were hard to establish with limited knowledge and scientific tools, causation of diseases entered the realm of super-natural and divine intervention, rather than being associated with filth and poor hygiene. After the Battle of Bosworth, also known as the Wars of the Roses, Henry VII, the King of England returned back to London in 1485, with the hired French mercenaries from Milford Haven, France. A deadly and novel disease broke out after 21 days of arrival and killed several 1000 people including aristocrats. The disease progressed extremely rapid and underwent a fatal course. No causative organisms could be substantially implicated till date; however, poor sanitation, improper sewage disposal, and contaminated water supplies have been postulated to harbor the infectious agent. In 1519, Spanish explorer Hernando Cortes discovered the New World, now Mexico. The Spanish conquest of the Aztecs Empire introduced smallpox from Europe to Central America. The result was similar to what had happened to Europe in the Common Era. The epidemic killed an estimated 8 million natives in the first 2 years, and by the turn of the century, 23 million natives out of 25 million people had perished. Smallpox was introduced to the South American shores of Chile in 1560, by the Spanish explorer Fransisco de Villagra. He won the Arauco War and colonized the area in search of gold. In the following year, an estimated 25% of the native population was killed by the epidemic. A century later the native population of North America was ravaged by the smallpox epidemic when the French and British settlers started to colonize. Twenty million Native Americans perished. Biological warfare was again witnessed during the Pontiac War, when the British forces at Fort Pitt gifted blankets and clothes from small pox-infested barracks to the Native American chiefs under pretext of goodwill. A deadly smallpox epidemic erupted in the Ohio Valley which turned the tide of the battle leading to successful colonization of the continent. Introduction of exotic diseases such as smallpox in population with no prior immunity like in American continent were partly the reason for successful colonial expansion. However, the next two narrative shows that the invading forces are also vulnerable to the endemic diseases present in the region. In 1794, Yellow fever exterminated the British forces sent to crush the Haitian Revolution in the colonies of St. Dominique. As per British historian Sir John Fortescue, nearly 5000 men of the Royal Army, 1150 men of the Royal Navy, and 6000 English settlers died in Haiti, West Indies due to “Black Vomit.” The 66th and 69th regiments were sent as reinforcement. However, by the end of 1796, only 713 men survived the epidemic. Panic-stricken colonizers finally left the islands, after loosing an estimated 4 million pounds and 1 lakh men. A decade later in Europe, Napoleon Bonaparte, marched eastwards to conquer Russia. The route was through Germany and Poland. Rural communities in Poland lived under unsanitary conditions, with putrid wells and lice-infested households. Napoleon ordered setting up of hospital detachments en route for the troops. However, conditions worsened after the spring rains, as the heavy supply carts moving in the rear was unable to keep pace with the infantry in the country roads. As the supply of fresh water from German rivers lagged, an outbreak of dysentery spreads among the soldiers. Problems escalated in Lithuania. Lack of water to wash bodies, compounded by the dirty and sweaty French uniforms made way for lice transmission. As the soldiers were required to sleep in close quarters, the infestation spread rapidly in the army. Troops suddenly started falling ill with high fever and reddish rashes over the body. Within a month, nearly 80,000 soldiers died of typhus. As the soldiers kept marching in the harsh Russian winters, lice infestation escalated in the warm bodies of the troops. DNA analysis from soldiers buried in defensive trenches at Vilnius, Lithuania revealed Rickettsia prowazekii, and Bartonella Quintana as the germs which annihilated the invincible Grande Army. By the end of the failed campaign, only 30,000 troops out of the 6 lakh strong French Army remained alive. Considerable advances in military medicine, hygiene, wartime clothing, water treatment, and logistic supply were made post this war. The Crimean War of 1853 was fought between the Russian empire under the banner of Eastern Orthodox Church and the alliance of Britain, France, and the Ottoman Empire. It brought paradigm shift in Military Medicine. Florence Nightingale and Pirogov entered the stage to improve nursing practices and to develop plaster casts and triage, respectively. The allied forces finally won the war. However, it was at a very high price as a cholera epidemic nearly wiped out the Naval forces at the Black Sea. Six thousand British soldiers succumbed to cholera at Selimiye Barracks Military Hospital and buried at Istanbul cemetery stands testimony to this ravage. Improved sanitation and hygiene on board ships were adopted in the aftermath of the war. During the same period, paradigm shift was made in the concepts of public health. With the discovery of microscope and observational scientific methods becoming popular with John Snow, the stage was set for Pasteur and later Koch to propose the germ theory. Theory of spontaneous generation, which had dictated that disease arose from nonliving things such as miasmas, was thereby rejected. Sanitary revolution propounded by the works of Chadwick largely vanquished the infectious diseases much before the discovery of disinfectants and antibiotics. The plot of the American Civil War was painted in unsanitary environment, battle wounds, malnourished troops, and infectious disease outbreaks. By the end of the war, nearly 4 lakh Union army, 60,000 Confederate soldiers, and 60,000 slaves lost their life to typhus fever, pneumonia, typhoid, diarrhea, and malaria. Epidemics halted several major campaigns and prolonged the fighting. During the Franco-Prussian War of 1870, vaccination against smallpox was mandatory in the Prussian Army but not among French soldiers. Smallpox epidemic spread from the French prisoner of wars to the Prussian solders and later to the civilians. It inspired stricter legislation in Germany and England and demonstrated the importance of prison camps. There was rapid and unplanned mobilization of the American soldiers during the Spanish-American War, 1898. This led to overcrowding of more than 50,000 recruits from dissimilar geographical locations and different immunity patterns in limited assembly camps. Typhoid epidemic spreads due to the unsanitary conditions of these temporary settlements. Later, during the war, yellow fever killed more American soldiers than the battle. This prompted Dr. Walter Reed, an American Army surgeon, to study the epidemiology of yellow fever. The Spanish flu pandemic of 1918–1919 killed more people than the World War I with an estimated figure between 20 and 40 million people. This is the highest mortality recorded for any epidemic. Among the dead were six hundred and seventy-five thousand American troops who were positioned in overcrowded trenches to hold the Western front. With the returning sick combatants, the epidemic spread in the United States infecting one-fourth of the population. As the pandemic spread for the next 2 years, a fifth of the world's population was infected. Unlike typical flu, this was most deadly for people aged between 20 and 40 years. On the eastern front, typhus caused three million deaths in Russia, Poland, and Romania between 1918 and 1922. Typhus was equally lethal for the care providers in the battlefield. As with the French and Russian troops in the Napoleonic conquest World War I, the German Army was incapacitated by typhus fever outbreak, when it invaded Russia in the winter of 1941. For the next 2 years, it then spread to North Africa and Iran. The allied soldiers used DDT delousing to prevent the spread of lice. Typhus epidemic also killed 1000 of prisoners in the Nazi Germany concentration camps of Auschwitz, Theresienstadt, and Bergen-Belsen. After the fall of Singapore, the British and Australian Prisoners of War (PoW) were detained at Changi prison and Seralang Barracks in the summer of 1942. Four PoW attempted an unsuccessful escape which enraged the Japanese captors. To forcibly obtain a no escape pledge, nearly 17,000 PoW were packed in a parade ground measuring 128 by 210 m in the Seralang Barracks for nearly 5 days. As there was no provision of water and sanitation, a dysentery outbreak spread among the PoW, forcing them to sign the pledge. World War II saw a few more regional outbreaks such as scrub typhus outbreak reported in the British Indian troops deployed in Burma during 1943. A contaminated yellow fever vaccine batch caused an outbreak of hepatitis B in nearly 28,000 US troops in 1943. Dengue increased in South-East Asia during the Second World War and the immediate postwar period, due to the spread of mosquitos and different virus strains. Lately, wars have also been very important in the re-emergence of diseases such as plague and cholera. The deforestation associated with the Viet Nam War in the 1970s, coupled with the collapse of the local infrastructure, is considered to be the cause of plague epidemic during the 1970s and early 1980s. Wars also spur widespread migrations who due to multiple disadvantages are prone to disease epidemics, such as the cholera epidemic in Goma, Democratic Republic of the Congo, which killed thousands of people in a short period of time during 1994. Recently (2017), a Polio outbreak was reported from war ravaged Syria in the displaced population. Newer knowledge emanating from war time veterans from the USA has brought noninfectious epidemics to the attention. An estimate from the Department of Veterans Affairs, USA, shows that 31% of Vietnam war veterans, 10% of Gulf War veterans, 11% of Afghanistan war veterans, and 20% of Iraq war veterans were affected by posttraumatic stress disorders (PTSDs). It might be more for the displaced native population. Public health is still grappling to address the issue. History is replete with examples where armies have been decimated by infections even before the first bullet was fired, resulting in reversal of fortunes in the battlefield. In the common era, major wars catalyzed the spread of infectious diseases, into novel territories such as the Plague of Athens into the Greek kingdom and the Antonine Plague into the Roman Empire. War supplies have also played an important role in the transmission of epidemics like the Plague of Justinian. By the middle age, conventional weapons were replaced by germs. Mongols during the Seige of Caffa and the British during the Pontiac war introduced biological warfare to the world. Improved modalities in travel and mass exodus of people from war-ravaged states, facilitated emergence of pandemics like the Plague of Europe and the Spanish flu. Epidemics of typhus and typhoid fever ravaged Europe from the middle ages till the World war II. With the advent of antibiotics and vaccines and newer diagnostics to identify the pathogen, morbidity and mortality due to infectious diseases have reduced in the battlefield but giving rise modern-day epidemics of PTSDs. Outbreaks and epidemics due to war and war-like situations in the modern era continue to evolve and disrupt health, thereby claiming millions of lives. As this situation is unlikely to change, it is imperative that proactive measures are taken based on the learnings from past epidemics; for history has a way of repeating itself. Smallman-Raynor MR, Cliff AD. War Epidemics: An Historical Geography of Infectious Diseases in Military Conflict and Civil Strife, 1850-2000. Vol. 1. New York: Oxford University Press; 2004. p. 54. Hornblower S. The Oxford Classical Dictionary. Vol. 4. New York: Oxford University Press; 2012. p. 480. Thucydides, Warner R, Finley MI. History of the Peloponnesian War. Vol. 1. London:Penguin Classics; 1972. p. 128-43. Sabbatani S, Fiorino S. The antonine plague and the decline of the Roman Empire. Infez Med 2009;17:261-75. Fears JR. The plague under Marcus Aurelius and the decline and fall of the Roman Empire. Infect Dis Clin North Am 2004;18:65-77. Horgan J. Justinian's Plague (541-542 CE). Ancient History Encyclopedia; 2014. Available from: http://www.ancient.eu/article/782. [Last accessed on 2018 Mar 10]. North J. The Death toll of Justinian's plague and its effect on the Byzantine empire. Armstrong Undergrad J Hist2013;3:1. Marr JS, Hubbard E, Cathey, JT. The Year of the elephant. Wikiversity J Med 2015;2:1-9. Fenner F., Henderson DA, Arita I, Jezek Z. Smallpox and its Eradication. History of International Public Health, No. 6. Geneva: World Health Organization; 1988. Wheelis M. Biological warfare at the 1346 siege of Caffa. Emerg Infect Dis 2002;8:971-5. Roberts L. Sweating sickness and Picardy sweat. Br Medv J 1945;2:196. Heyman P, Simons L, Cochez C. Were the English sweating sickness and the Picardy sweat caused by Hantaviruses? Viruses 2014;6:151-71. Arana DB. Historia General de Chile. Vol. 2. Santiago, Chile: Santiago de Chile University Press; 2000. p. 231-2. Ward MC. The Microbes of War: The British Army and Epidemic Disease among the Ohio Indians, 1758–1765. East Lansing: Michigan State University Press; 2001. Marr JS, Cathey JT. The 1802 Saint-Domingue yellow fever epidemic and the Louisiana purchase. J Public Health Manag Pract 2013;19:77-82. Burky T. The illustrious dead: The terrifying story of how typhus killed Napoleon's greatest army. Lancet Infect Dis 2010;10:748. Bechah Y, Capo C, Mege JL, Raoult D. Epidemic typhus. Lancet Infect Dis 2008;8:417-26. Texas Department of State Health Services, History of Smallpox. Available from: http://www.Dshs.state.tx.us. [Last accessed on 2018 Mar 11]. Zarafonetis CJ. Internal medicine in world war II, Coates JB. Office of Surgeon General, Medical department US army. Washington DC 1963;2:278. Thompson P. The Battle for Singapore – The True Story of the Greatest Catastrophe of World War II. Vol. 1. United Kingdom: Portraits Books; 2005. p. 389-90.